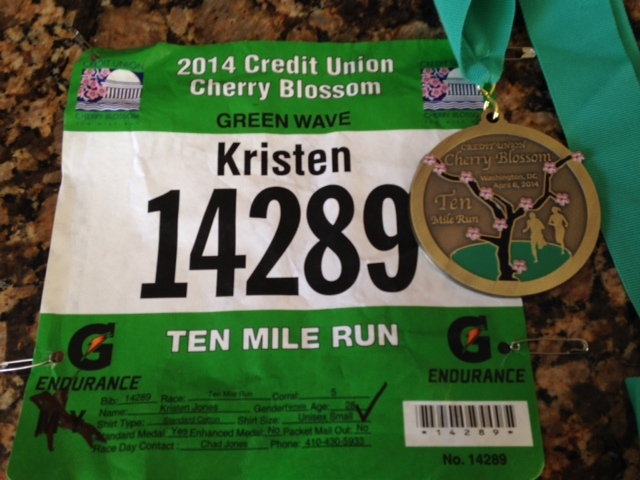 Back in the late fall/early winter my sister sent me the email to sign up for the Cherry Blossom Ten Miler lottery. A few years back I signed up and was drawn to run the race but I actually did not run in it because of a delayed flight home from my spring break trip to California. When we were chosen once again to run in the 10 miler I was ecstatic. As of late I have been oddly obsessed with D.C. and I blame Kerri Washington and the show scandal. For all I know that show could be filmed in New Mexico but it just made me fall in love with D.C. and all that it has to offer. Growing up I always lived a few hours away from the Nation’s capital, but we never really took many trips there. Living close to the beach has it perks but one downfall is that it is hard to leave- even if it just for the day. Last spring my sister and I ran the Nike Women’s Half Marathon but I was majorly pregnant so my goal was Georgetown cupcakes and survival. This time around I really wanted to enjoy the city and cupcakes of course! 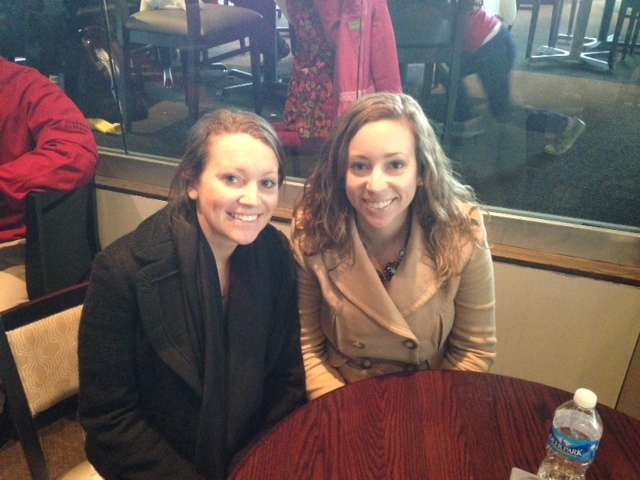 We headed to D.C. around noon on Saturday and went straight to the expo. I must say it was very well organized and a breeze to get through. There were plenty of vendors and of course we stopped by the Sparkly Soul booth to add some more amazing headbands to our always growing collect. Once we had gathered our race day necessities at the expo we headed to the hotel which was within walking distance to the start line. 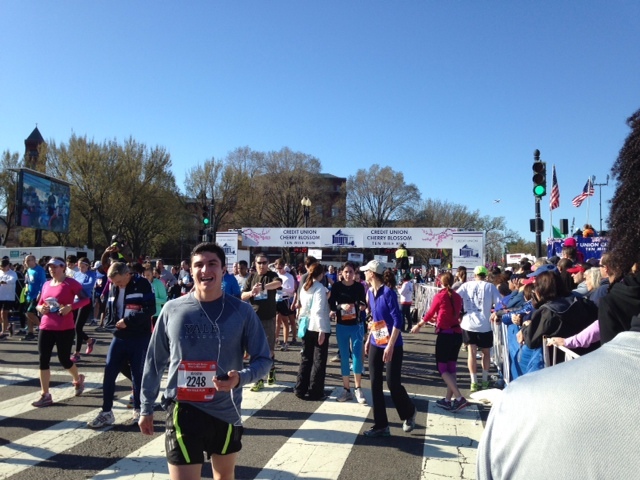 If you ever are doing a race in D.C. I highly suggest finding a hotel near the start line. It makes things SO easy the morning of the race! 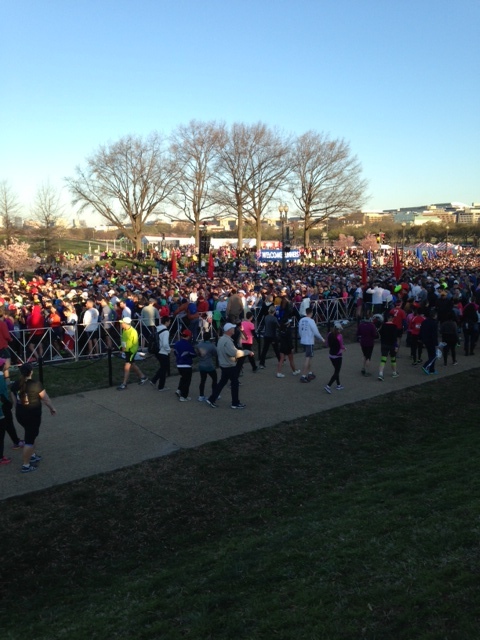 No hustle and bustle of the metro- just walk out of the hotel and head to the start!! 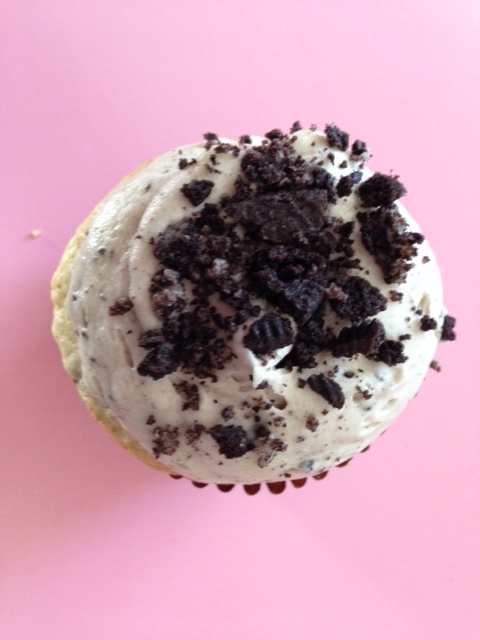 We headed to Georgetown to visit a few restaurants and of course pick up the cupcakes! We enjoyed some of the local places and settled on Thunder Burger for dinner. It was a neat little place with a major rock and roll vibe going on. They had a great variety of burgers! Since D.C. and surrounding neighborhoods were packed for the weekend- we were pumped that we were able to make a reservation and not have to wait for dinner! After dinner we were stuffed and we headed back to our hotel to get some rest before the big race! I did not decide upon any official goals for this race. I knew it would be packed so I did not want to have a specific time in mind and be disappointed that I did not achieve it. I knew that my fastest 10-miler was around 1:45 so I would hope to finish quicker than that-especially because my last 10-mile solo training run I finished in 1:40!! 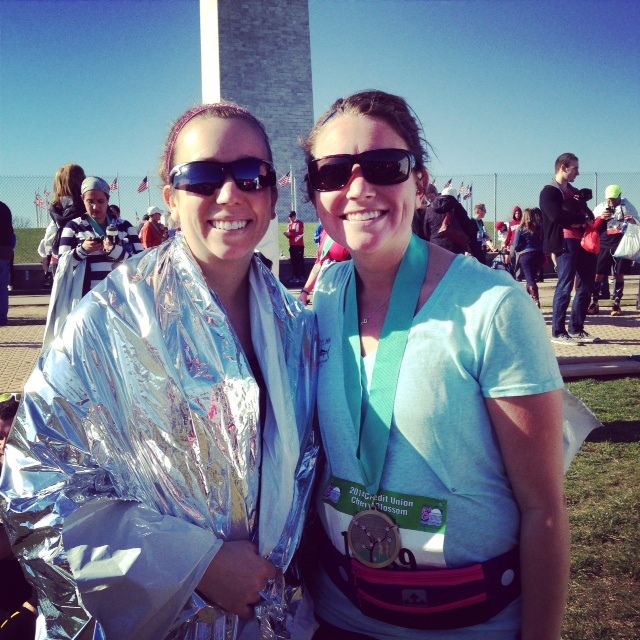 I felt really good going into this race, as I have been training for the St. Michael’s Half Marathon which is in May (ambkristenjo saves you $ if you want to join in on the fun!!!). 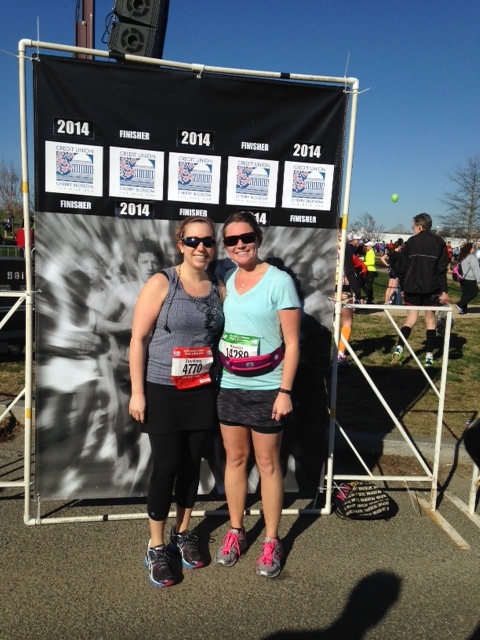 It was around 40 degrees at the start of the race and was chilly, especially if you happened to be in the shade. I know I always get hot when running so I did not layer up- just opted to be cold until we started moving! I wore my new Athleta 2-in-1 skirt that ordered from Zulily (if you want to join in, let me know and I will send you an email- awesome site!!!) and it was awesome! Super comfy and did not ride up or budge during the 10 mile run! I am in love and wish I would of ordered 5 of them!! As we were walking up to the start, the Women’s elite and then the 1st corral were taking off! The starting area was completely packed but the wave start was super organized and was not overly congested as I thought it might be. 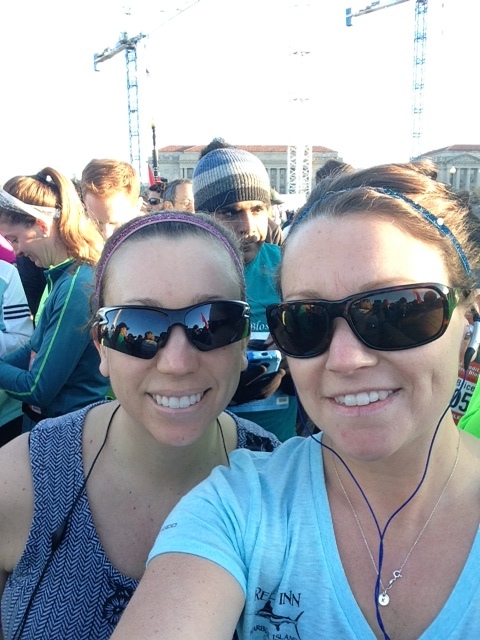 My sister was in the 2nd corral so I jumped in with her and we started about 10 minutes later. 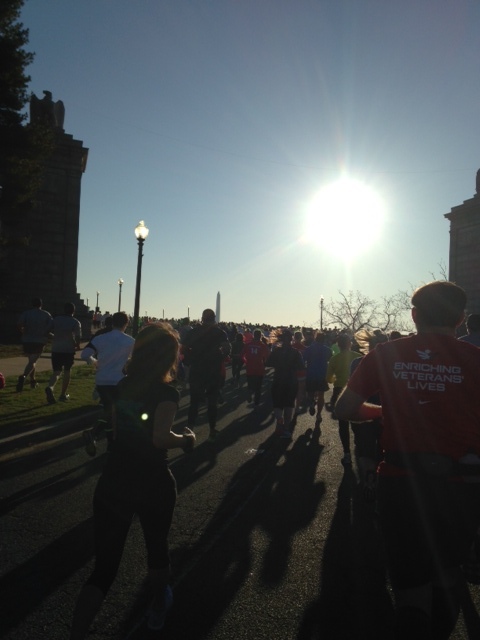 The first 5 miles of the race were awesome! 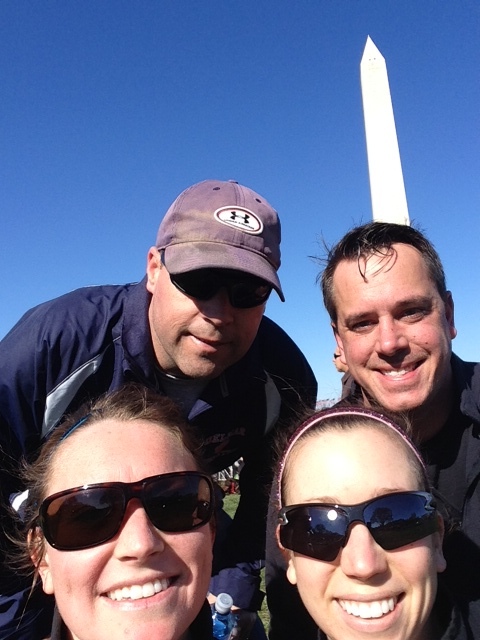 We ran around all the Monuments and Memorials and it was beautiful as the sun was really starting to shine then! The worry of being cold was gone and we were having some fun in the sun! As we were running I only took 2 photos. 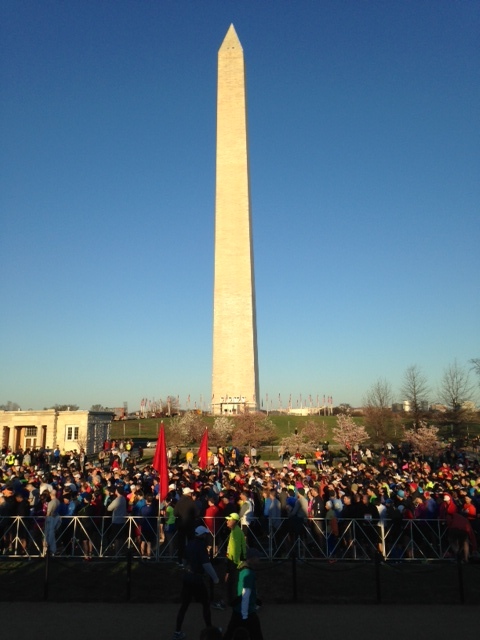 I was hoping for some beautiful Cherry Blossom photos, especially while running the tidal basin portion of the race, but unfortunately they blossom missed the memo that they were supposed to be the star of the race! I am hoping that when the hubs and I take another trip to D.C. next week the blossoms will still be around! 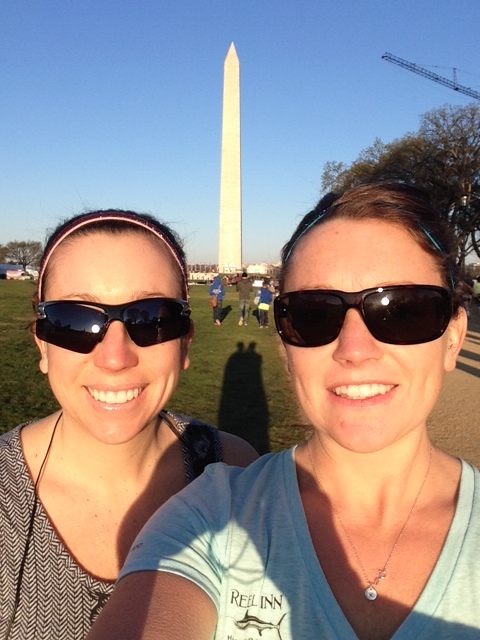 The last 5 miles consisted of the tidal basin. Sorry to say that this part of the race is boring!! No spectators, no cherry blossoms, just a few water stops. Luckily some spectators did set up an unofficial beer and oreo stop! I got a good laugh at that and was relieved that we only have about 3 miles left to go! As my sister and I were running we checked out the clocks at each mile marker so we knew what our finish time would be around. The last mile I really got tired and I could it was because I was hungry and not because my legs were tired. As the finish line approached my sister was able to pick up a notch and finish in 1:32- I however kept at my slow pace and ended up finish in 1:33! I was super happy with my results! After we finished Courtney and I posed for a few pictures and we headed to the finisher’s area to retrieve the medal that I paid $5.00 extra to receive. I must say for the small amount of extra money it was a very nice medal! Now I just need to order that medal rack I keep talking about! After a few phone calls we were able to meet up my our husbands, take a few more selfies and then head back to the hotel to pack up and start out journey home! Overall I really enjoyed this race and was thrilled with my finishing time. I thought it was very well organized and was an all around smooth experience for all of us! The weather was amazing and honestly we could have not asked for anything better! 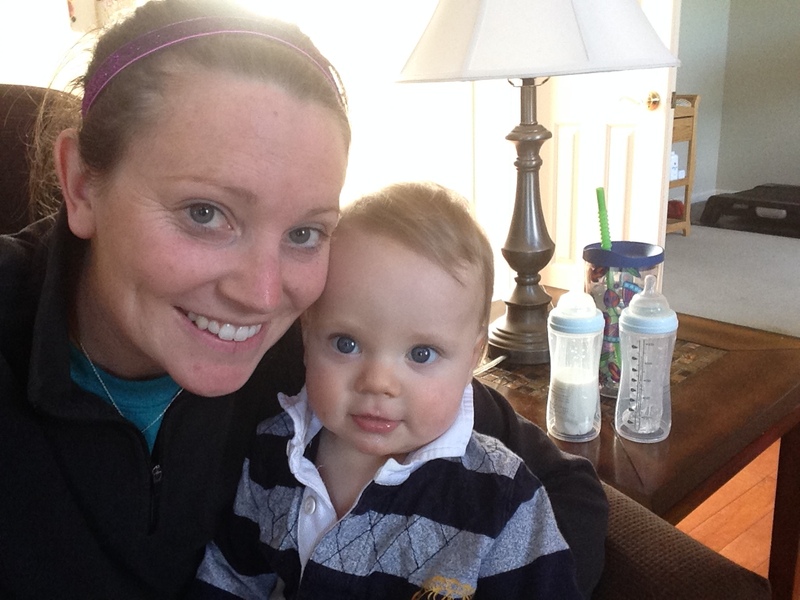 We headed back to Delaware and I got to indulge in a few well earned cupcakes and sneak in some cuddles before nap time! 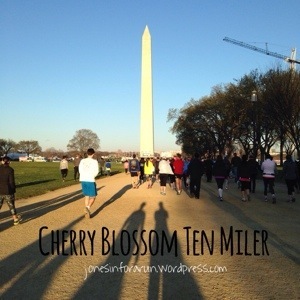 Have you ever ran the Cherry Blossom Ten Miler? If so what did you think? What is your favorite Spring Race? How good does that cupcake look? Next Post Liebster Award x 2! I really did enjoy it! I really love the vibe of DC and am looking forward to going for a visit again next week!